When Johanna said that, I felt light, warm in that spot just above my stomach where it usually feels clenched and tight. Then, Johanna moves in next door, and obliterates Finn’s Contract of Noncommunication. Even though breast cancer has destroyed her body, she has enough spirit to transform the neighborhood. She hires Finn to create a garden in his own yard. Finn and his closest friend become hustlers, hitting up construction workers and the inhabitants of the nearby nursing home for pledge money, money to support Johanna in her cancer triathlon project. Suddenly, there are parties. People are talking to each other again. It is a beautiful thing to see. I always say that it’s rare and surprising when a book makes me cry, but I’m starting to suspect that it isn’t the truth anymore. I 1) either choose books that make me cry or 2) am simply prone to crying. 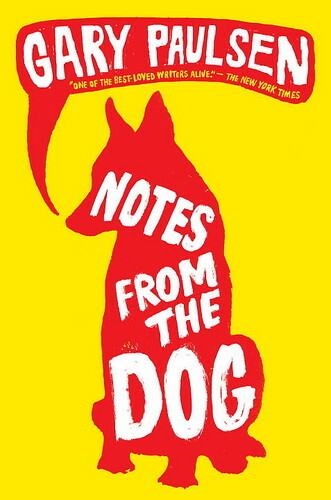 Either way, this story did it, too-from the second the dog wrote his first note. Finn’s story is short, simply told, and reminds us of the importance of being kind to each other. You’ll love how the awkwardness of being fourteen is combined with the gravity of cancer and how a life-threatening disease doesn’t destroy Johanna’s giant, soft heart. I’d love to see this book in a classroom. Gary Paulsen is the deserving recipient of the Margaret Edwards award, an honor presented to authors celebrating their lifelong achievement and contributions to the literary world. Paulsen, Gary. Notes From the Dog. Wendy Lamb Books: New York, 2009. 132 pp. Ages 12-15. Posted on March 16, 2012 by ShannaPosted in Margaret Edwards Award (to honor author's lifetime achievement), Realistic Fiction, Uncategorized, YA LitTagged breast cancer, death, gardening, Gary Paulsen, summer vacation.